Gandhinagar : Prime Minister Narendra Modi on Saturday morning paid a visit to his mother in Gandhinagar to take blessings as he turns 66. He touched her feets and then sat along for some time. Clad in his trademark Kurta-Pyjama attire, PM Modi went to meet his mother in single car, without accompanying carcade or any officials. On eve of PM's birthday, people in Gujarat lit up 989 lamps simultaneously to make a Guinness World Record. # Prime Minister Narendra Modi turns 66 on Saturday. 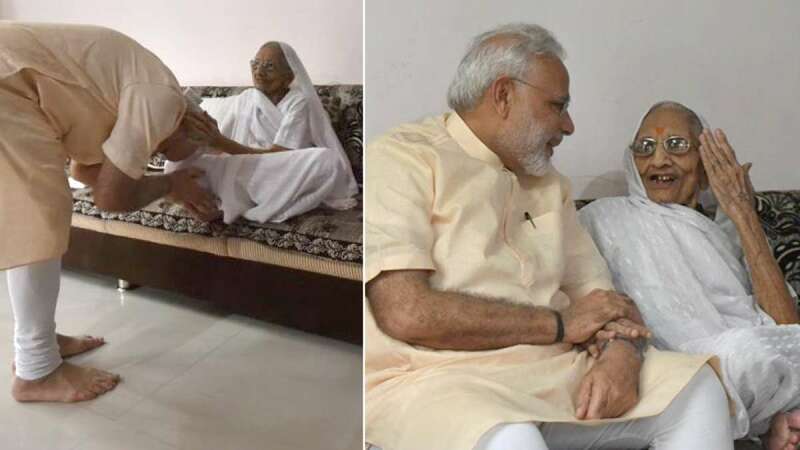 # He paid a special visit to his mother in Gandhinagar, Gujarat. # PM Modi ditched all officials as he went to meet his mother. # While moving out he greeted residents near his mother's house. # A Guinness World record has also been made on the eve of his birthday.